Congratulations and Welcome to Philasia Maritime Services Training Center Inc.! Your experience and contribution will play a major role in the future development and growth of the company. Similarly, the company will strive to provide you with the best training and services, career opportunities and we guarantee to provide customer satisfaction results to our clients. We are not only aiming to be the best Cebu Maritime Training Center as well as nationwide. We hope you will enjoy your experience with Philasia Maritime and we wish you the very best in navigating with us. We value our people and believe that people are our best assets, so we offer a range of competitive salaries, employee-friendly policies, rewards, and benefits. We offer professional development and every employee has an equal chance to develop and reach his/ her full potentials. We provide challenges and opportunities to grow. Working with Philasia Maritime is never dull; the employee can look forward to a challenging yet rewarding career with us. We offer an attractive reward scheme thru rebates with minimum quota. Our Mission is to achieve a high standard of training services in a comfortable learning environment; generate qualified trainees in compliance with the National Regulatory Requirements with enhanced customer satisfaction. Our Corporate Vision is to maintain a high standard of training services. To offer a wide range of training courses with the aim of becoming the leader of training and service provider in the Maritime Industry. 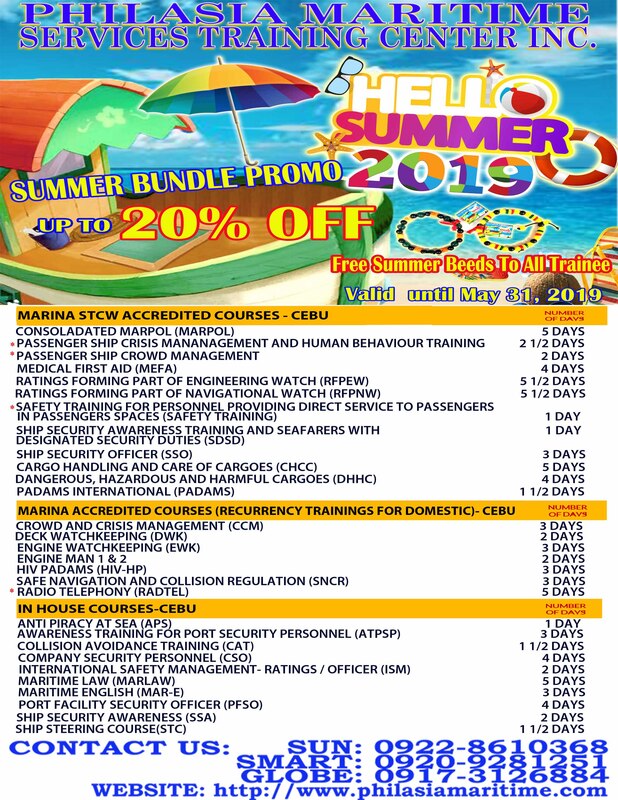 Philasia Maritime Services Training Center Inc. is committed to providing standard maritime training and services for Deck and Engine Officers, Ratings and ship’s crew. We guarantee to provide Customer Satisfaction results from a Motivated Workforce. Innovate our product and services to achieve operational excellence. Ensure our work is consistent with our commitment to comply with the requirements based on ISO 9001:2015. To be the epitome of training centers not only in the Philippines but in the world. To be able to maintain and uplift the level of quality service being provided to its’ clients individually and the maritime industry as a whole. To be able to not only fulfill but surpass the minimum requirements as prescribed by the STCW Conventions of International Convention on Standards of Training, Certification, and Watchkeeping for Seafarers, 1978, as amended in 1995. To be able to arm its’ clients with the necessary knowledge and techniques that are essential in the discharge of every seafarer’ function both onboard and at the docks. 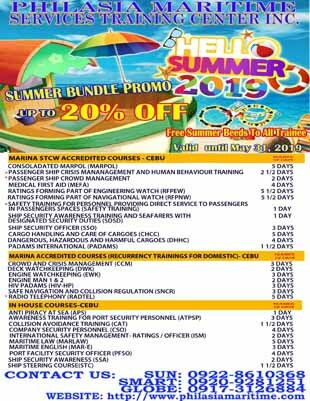 To be the best Cebu Maritime Training Center as well as nationwide. To be able to assist its’ clients in apprenticeship. To be able to assist its’ clients in securing employment whether in the Philippines or abroad. All Rights Reserved. + Service by PMSTC INC.